Tommie Talley back getting taxpayer&apos;s loot for nothing? Municipal Employees’ Annuity and Benefit Fund of Chicago at 321 North Clark Street, Suite 700 Chicago, Illinois 60654 welcomed Tommie Talley today. Tommie was removed after a disgraceful employment at the City of Chicago Department of Water Management. 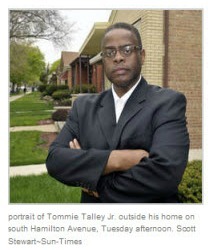 Must have been Tommie ordering City Workers to make free repairs at the Daley’s 11Th Ward Church that sealed the deal. Tommie then marched over to the County until Dane Placko busted him on Fox News Chicago. Tommie had some serious clout for a long time. I do not think criminal activity should allow folks to collect a pension and Tommie Talley is much too young to collect money for nothing. My inside guy told me Tommie was going to buy a Subway Franchise and make a go of that years back, guess that failed also. I know when Tommie Talley sent a worker to the Central District for retaliation; he did not look over his back for payback. I am against Tommie Talley taking any kind of money from the taxpayers after his lousy work at the Water Department. We need some real detective work to find out what is going on. The scoop was given to Chicago Clout January, 18, 2012 by one of our detectives. Chicago Clout is everywhere, we are after you next, “snicker”. Maybe Tommie can stop by Dean Slawek’s attempt to sneak back into the city with his highbrow gun lawyer. The scam starts on February 10, 2012. Watches out all you unemployed Chicago Plumbers, go to City Hall 11Th Floor 10:00 AM. See if the James Sullivan sells out the Plumbing License Law for a doorbell ringer. NO MORE SCAMS CITY HALL. Where the heck are the FEDS? Next PostNext Chicago Fire Department need working Fire Hydrants NOW!